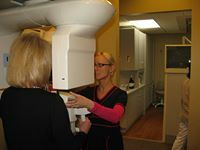 A 3D CT Scan offers a more precise view of the root area of the tooth to be extracted than traditional x-rays. As a Doctor of Dental Surgery, Dr. Peter J. Pagano has 40+ years of oral surgery experience. Tooth extractions, including wisdom teeth, and preparation for dental implants are the most common oral surgical procedures performed in our office. We provide a relaxed environment with caring staff and state-of-the-art facilities. In the case of decay or a broken tooth, Dr. Pete prefers to save the natural tooth. When that clearly is not the best option, extraction of the tooth can be done and tooth replacement options can then be presented. When removal of a tooth is necessary to make space for orthodontic treatment. At Artistic Dentistry, we provide ALL tooth replacement options, from same day dental implants to bridges and crowns. Over his forty years of practice, Doc has relentlessly sought techniques for reducing an even eliminating discomfort, trauma and pain for dental patients. It’s commonplace for our our patients to exclaim how surprised they are at the overall comfort of their experience. In other words, if you’re afraid of needles or sensation of a shot, you’ll probably be surprised at how quickly and effortlessly the procedure is. Click the button below to schedule an appointment. We’ll respond within 24 hours or less.